I love vacations. I love traveling. I love having the entire family together. But it is a fact that the variation in the everyday routine does send my toddler on a craziness spin… and what suffers the most is his sleeping routine. Specially if the sleeping arrangements are too different from home — like having his sleep in the same room with Mom and Dad. This is a lot harder than it sounds. As I came to learn, keeping the routine means also responding in a consistent way throughout the night, no matter where you are. Again, sometimes this is impossible… but you can try. I so wish I could have done this (and stuck with it) when we went away for the first time at Shaver Lake. Up to that point my baby was sleeping through the night, I would sing to him, feed him and then put him down on his crib. It was easy, it was great. But he was sleeping in the same room as his sister and us, and he also got a cold after the trip… that combined with a growth spurt and teething made that bedtime routine go out the window. I was never able to go back to that, but we finally settled into some sort of routine, which I wrote about here. While in Mexico, I tried to follow the established routine: putting his pajamas a sleep-sack on, then reading a story and breast-feeding him while cuddling to sleep. To put him down for the night that worked great, but the problem came in the middle of the night. He was sleeping in the same bedroom with me, and going through an intense separation anxiety phase. He was still teething and I was mortified about letting him fuss as we were in an apartment building with very thin walls. He ended up waking up every night between 2 and 4 AM to hop in bed with me. Coming back home from that trip was really hard, as he expected the same treatment… and I was dead set against having a family bed. After a couple of nights of not getting him out of the crib (keeping him company in his room, but not getting him out), he finally went back to his normal routine. When we went to upstate NY, he had his own room, and this time I made sure not to take him out of the crib if he woke up in the middle of the night. I would give him his pacifier and cover him up, and he would go down again no problem. We still kept the whole pajamas-story-milk routine, and things went great. Our last trip last year, for Christmas, Tiny A was again in the same room as Mom and Dad — but with all the family and craziness going around, his bed times were erratic and he kept on waking in the middle of the night. He would see us and then go back to sleep… but when we came back home, he had a very hard time sleeping in his room on his own again. Again, while on vacation, this is also a hard one to enforce… but if at all possible, it does make a difference on the quality of sleep your child will get at night. If you can manage to do naps and bedtimes and consistent times, your Toddler will ease into the new place easier, as they will know what to expect and when. If you will be traveling for a short time (about a week), it is best to try and keep naps and bedtimes in your own time-zone… even if that means naps at 1 and bedtime at 9:30. 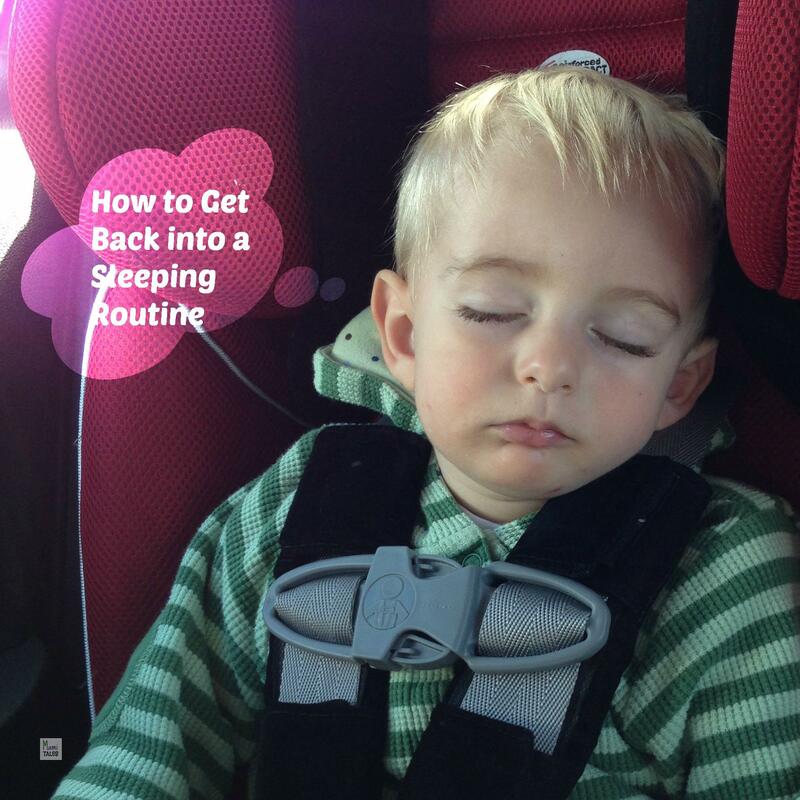 If you will not do that, or plan to travel longer than that, try to ease your little one little by little — either by starting to switch their time-clock before you travel, or by doing it an hour at the time once you get to your destination… and once you come back home, the process needs to be reversed too. Once you’re back home, return to your normal sleeping routine as fast as you can. There will be tears. There will be protests… But the longer you take to go back to their regular schedule, the longer you’ll have sleepless nights for everyone. That has been my experience so far… and I know there are many other factors to account for (like teething, illness, separation anxiety, etc, etc), but the firmer you are, the sooner things will return back to normal. If you can return to a regular everyday routine, the easier it will be for your little one too… they need to have a sense of what will happen next to gain back their sense of normalcy. I most definitely don’t posses the holy grail of Toddler sleep, but this is my experience so far and it is what is helping me now. If you have any other tips, please share! I’d love to include any other advise. Great advice!! I totally agree with getting back onto schedule ASAP! Though I do love vacations, so I can bend the rules and cuddle….